567 Collins Street is a 28 storey, 50,000 square metre new office building in the heart of Melbourne. To meet the standards of a Premium Grade Building, it must have full power back-up. In most buildings a diesel or gas powered generation system would be placed on the roof or a podium level, so the exhaust fumes can be easily discharged upwards without impacting people or property. However at 567 Collins, construction time constraints saw the architects and developer determine the plant room should be on Level 3 within close proximity to an adjacent public car park. The plant room is located at the back of the building so exhaust discharge pipes don’t have an aesthetic impact on the front façade of the building. “The problem we faced was how to discharge and dilute the diesel exhaust fumes on a lower level, next to a car park, without exposing people and property to dangerously high temperatures,” said Sam Waters, AE Smith’s lead engineer on the project. A dilution system was necessary to lower the exhaust temperatures from 470 degrees to 60 degrees before the plume of exhaust gases reached the public car park. “We evaluated a number of options and worked closely with Floth Engineering Consultants to model each solution to determine the best approach,” Sam said. The first option evaluated was an Exhaust Fume Diluter, an ‘off-the-shelf’ product distributed by Norman G Clark, often used for underground mining and power generation applications. It acts like an induction fan, drawing in clean, cool, air at the exhaust point of discharge. Unfortunately, to lower the temperatures fast enough, the Exhaust Gas Diluter would push so much pressure back up the pipes and into the diesel engine that it would fail. A draught inducer fan was considered, but these are very large, very noisy and utilise a lot of power. A third solution involved a mixing plenum, however Floth’s Computational Fluid Dynamic (CFD) modeling showed that it could result in damage to the façade of the structure and, more dangerously, exhaust gases being pumped back into the plant room. “It was at this point that we realised we’d need a new product to solve the problem. We knew we could find a better way, so we reached out to our suppliers” said Sam Waters. It took nine months working closely with Nett Technologies and their Australian distributor Norman G Clark to develop an effective solution. The world-first solution has been coined by the AE Smith team as the ‘Collins’ Diluter, with Nett Technologies yet to announce an official product name. It is significantly larger than a standard diluter, square instead of round, and has blades instead of nozzles. 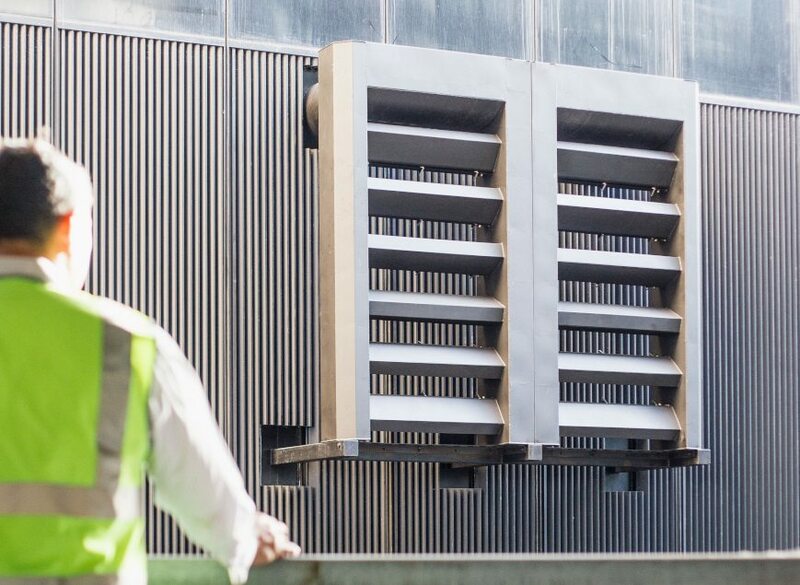 It still requires external ventilation to access fresh air, but due to its unique design, its external components can be easily integrated, or hidden on the non-public facades of a building. “Making the diluter a square shape rather than a big circle, means it won’t impact the aesthetic of the building,” explained Riki. Vitally, Nett Technologies CFD modeling shows the Collins Diluter reduces the pressure drop to 2,500 Pa (which is within limits) and results in a temperature drop from 470°C to below 60°C in just 5.5 metres. This is a huge improvement on the previous modeling of 470°C to 120°C over the same distance.